I suppose that you have faced such situation before: you prepared some exciting improvements of your products and wanted to let your customers and affiliates know about them, but gathering email addresses of your customers took some precious hours, while contacting your affiliates was practically impossible because all you knew about them was just their names. In Click2Sell you won’t face such issues. By just a few clicks you can message all your customers and affiliates at once. No manual collecting of emails is necessary, Click2Sell will do it for you. All that you need to do is just to prepare a text which you want to send to your customers or affiliates. The mailer is especially useful, if you continuously update your products or services and want others to know about the changes. It is a widely accepted truth in marketing that you have to announce about your every new product to people who could be interested in it. Even though we are not some PR company and thus naturally can’t distribute news to every corner of related business areas about updates of your new products, however the Mailer will help you to reach people who will be 100% interested in whatever you have to say: people who ordered something from you in the past and your business partners who promote your other products. The very last my mentioned point is especially useful when you want to keep your business neat and avoid situations when you make some changes in your products or services, but your affiliates keep promoting old versions. HOW TO USE THE MAILER? It is very easy: just log in to your Click2Sell account, go to “For Merchant” section and click on “Mailer” link in the main menu. All of the fields are self explanatory and you will be able to use a robust text editor to make your message look in any way you want. 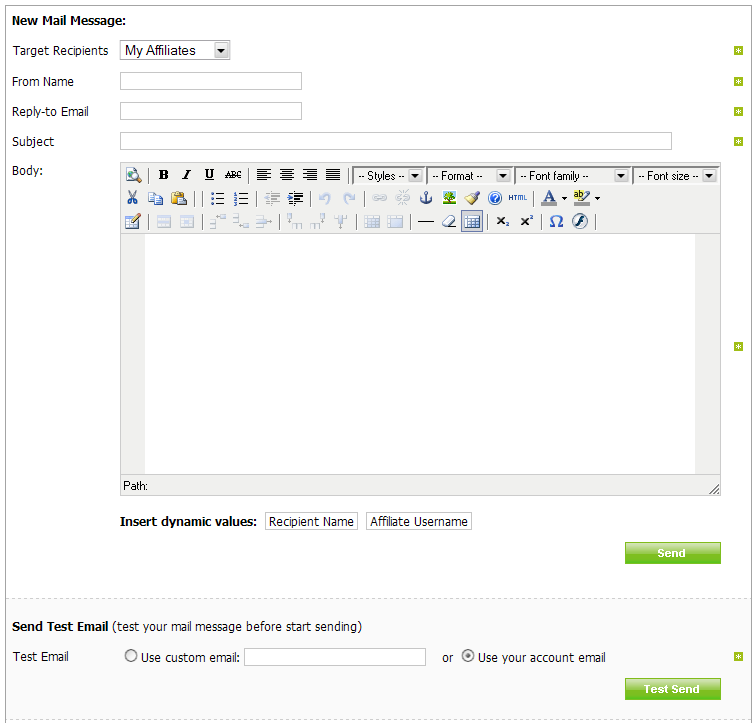 Do not hesitate to try various options by sending test messages to yourself (just find “Send Test Email” section there). 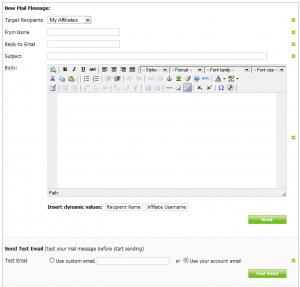 You can send as many test emails to your specified email address as you want. Please note that you can send only 2 messages per week to your customers or affiliates, so make sure that you tell them everything you want in every message you send. We are open to hear your opinions or suggestions about the Mailer (or any other feature in Click2Sell). Just drop us a message and let’s discuss about your suggestion!